TL and I have been lucky enough to zipline a few times before - one of them being in Switzerland! 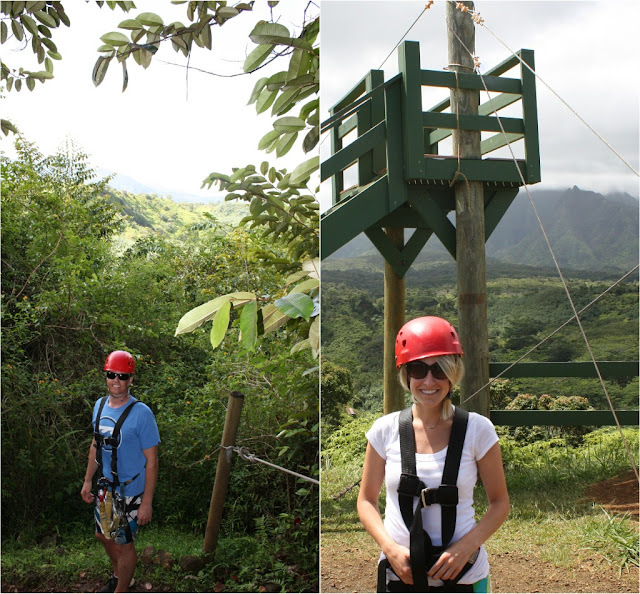 Kauai's Rain Forest is breathtaking, and we loved going here! We made the drive from Princeville to Lihue and then hopped on their "adventure bus" and they took us on a 30 minute ride through the backcountry to get to our first zip. The highest zip is a little more than 250 feet above the ground, and the longest is 1,200 feet long. Today is our last day in Kauai - we are relaxing by the pool & beach! I still can't get over the awesomeness of the new hair, fyi. Looks like you guys are having a great time!! Enjoy your last day in Kauai (not that you'll have to try real hard to accomplish that...) ;-) Travel safely tomorrow! I love ziplining, your haircut (seriously, it's perfect), and how cute you and Tim are together! :) I'm glad Hawaii has been such an amazing time for the two of you to celebrate your anniversary! So much fun!! I got to zip line in Jamaica and it was a blast! I hope you enjoyed your vacation!! SOooooooooo FUN! The view, in person, must be breathtaking! I wish I had the courage to do that! The pictures are amazing! We went ziplining through Costa Rica on our honeymoon! So amazing! Looks like you guys had a blast! Enjoy your day! The pictures are beautiful thanks for sharing I would never see the view otherwise I can't make it to the top of a ladder lol can't do heights. have a great remaining safe trip! That would be soo much fun! Wow, that looks SO fun!!!! This looks like SO much fun! I've always wanted to do ziplining! tha is where i went zip lining! it was so much fun and gorgeous.